Capsule Summary: Hawkeye and Trapper scheme to bring a plastic surgeon to the 4077th to perform an operation on the nose of a desperate soldier. There isn’t much story here but that doesn’t mean it’s a weak episode. It features just the one storyline: the plight of Private Danny Baker. Every character tied into that storyline somehow, from Radar keeping Henry in the dark to Father Mulcahy bringing Baker to Hawkeye and Trapper. Although I’m not convinced Mulcahy’s scenes were absolutely necessary, they don’t really feel like filler. I especially like how hard Henry tried to stay unaware of what was happening while remaining supportive. 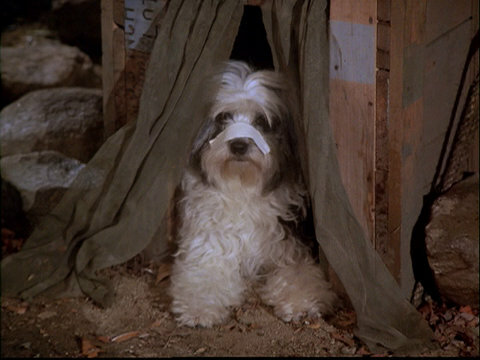 The complicated plan to get Private Baker a new nose is reminiscent of other complicated plans cooked up by Hawkeye and Trapper. The whole thing is only necessary because Frank and Margaret are snooping around. The two actually come off somewhat well here because they easily figure out what’s going on. The scene near the end of the episode in which Frank and Margaret walk outside and see bandages on the noses of everyone in camp is hilarious. Even the rarely-seen camp dog got one. Still, all those bandages may not have been necessary if Radar hadn’t been wandering around with a perfectly healthy nose. If Radar stayed hidden in the OR and then walked out with a bandage on his nose, Frank and Margaret probably would’ve left it alone. When it comes to guest stars in “Operation Noselift,” both Stuart Margolin and Todd Susman are wonderful as Major Robbins and Private Baker, respectively. Margolin earlier played Captain Sherman in “Bananas, Crackers and Nuts” during Season 1 and also accosted Margaret. I wonder if Margaret pressed charges. Todd Susman, of course, was one of the uncredited voice actors performing the PA announcements on M*A*S*H. Whatever makeup/prosthetic Susman wore to extend his nose is unfortunately very noticeable at times. It’s interesting that we never see Private Baker after his surgery. Even the dog got a nose job. I’ve read over the years that there was very little improvisation on M*A*S*H, at least with regard to scripts and dialogue. But I always wonder whether the actors ever improvised actions their characters took. For example, was it in the script for Henry to snag his finger on one of the fishhooks on his hat or was that something McLean Stevenson came up with? Or perhaps director Hy Averback thought it up? Likewise, just prior to the fishhook incident, when the MPs first brought Private Baker into Henry’s office, Henry gets his leg stuck in his chair while jumping off his desk. Was that in the script? What about the gag involving Henry’s doll: Trapper knocking it over, breaking it, and stuffing it in a box? Henry later demands to know who did it. It’s hilarious. Somebody had to think of it. Was it in the script? Henry mentions the 4077th’s Mardi Gras party, which means this episode takes place in February. What are the odds this episode was the one randomly chosen for me to review right before Mardi Gras? Henry mentions two films–The Blob and The Thing–being shown in one week. The Blob wasn’t released until 1958, long after the Korean War ended. Erik Tarloff, who wrote the script for this episode based on a story he co-wrote with Paul Richards, later wrote two other episodes: “The Price” and “Your Retention Please.” He also wrote an episode of Trapper John, M.D. and two episodes of House Calls (which starred Wayne Rogers). When Henry is trying to guess the identity of “SS,” the last name he suggests is Sid Caesar (whose last name doesn’t start with an S). Larry Gelbart was a writer for Caesar’s Hour, which ran on NBC from 1954 to 1957. The only thing that really bothers me about this episode is the fact that we don’t see Baker’s new nose . . . I mean, it’s pretty clear the nose we see him with during the episode is prosthetic, which leads you to believe we’ll see his new nose in the end, but we don’t. Like you said, RJ, they didn’t do very much improv…..But, there was a scene in the Swamp in one particular episode where Hawkeye was using an old-style bug sprayer, of which came apart when he was using it. He then smacked with the handle end whatever he was spraying. It was at that point where Radar said “What the H— was that?”.That HAD to have been improv, which I’m glad they left in and not on the editing room floor…..That always cracks me up! Funny episode, despite the obviously silly premise. Stuart Margolin plays a sleazy, rat-like character as well as anyone I have ever seen. I have always enjoyed his brief appearances on M*A*S*H and he adds quite a bit to the Rockford Files as the semi-regular character Angel. 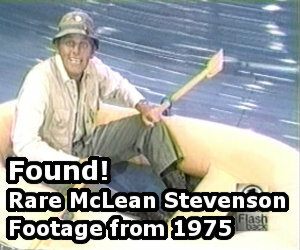 Mclean Stevenson made physical comedy appear so natural. I never feel he is acting when he does something clumsy, such as catching his finger on the fish hook, or tossing a glass of brandy in his own face in “Divided we stand”.